Big and bold with classic designs in curved and geometric shapes, Chanour Jewelry comes from Turkey. Elements are cast in pewter, then antique silver plated for satin sheen. Lead and nickel free. While pewter is generally a lighter material, the larger size on some of these wonderful necklaces and earrings will carry their boldness with a bit of weightiness (but not too heavy to wear)! More Chanour . . . Page 1 Page 2 | Outlet SALE! 5 larger maze elements about 2x1 inches are joined with single jump rings to paired smaller squiggles at each end, for a collar that curves gracefully 18-19 inches around neck. Each element is cast in pewter, antique silver plated for satin sheen, lead and nickel free materials. Made in Turkey, weighs about 2 oz. 2-1/2 inches long including surgical earwire, 1-1/8 inch across. The ornate curves and circles form hearts joined by jump rings, cast in pewter and antique silver plated. Lead and nickel free, weigh less than 1/3 ounce for the pair. 3-3/4 inches long including surgical earwire, 1/2 inch across. The 9 open squares are interlinked in a flowing long line, cast in pewter and antique silver plated. Lead and nickel free, weigh less than 1/3 ounce for the pair. 2-1/2 inches long including surgical earwire, 9/16 inch across. The rectangle has a rustic holey motif, cast in pewter and antique silver plated. Lead and nickel free, weigh less than 1/4 ounce for the pair. 2-1/4 inches long including surgical earwire, 5/8 inch across. The pair of simple open ovals interlock and swing, cast in pewter and antique silver plated. Lead and nickel free, weigh less than 1/4 ounce for the pair. 1-7/8 inches long including surgical earwire, 1 inch across. Square with dotted edges has hollow raised pyramid at its center, cast in pewter and antique silver plated. Lead and nickel free. 2-1/2 inches long including surgical earwire, 1/2 inch across. The graceful tapered tower panels have open honeycomb pattern in rustic style, cast in pewter and antique silver plated. Lead and nickel free, weigh less than 1/3 ounce for the pair. Rustic, ancient, freeform shapes are defined by their irregularity, holes and bumps. At center is a largest 2 inch element, joined on each side with dual jump rings to other narrower pieces, 3 on each side. 18-21 inches long with extender chain and shepherd hook clasp, can easily be made shorter with fewer chain links in back. Each element is cast in pewter, antique silver plated for satin sheen, lead and nickel free materials. Made in Turkey, weighs less than 3 oz. 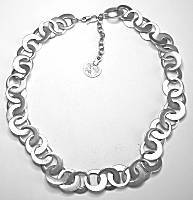 Circles with off-center holes are interlocked for a simply stunning chain, 20 inches of circles that 3/4 inch wide. Shepherd hook clasp closes 20-22 inches finished length. Each element is cast in pewter, antique silver plated for satin sheen, lead and nickel free materials. Made in Turkey, weighs about 2-1/4 oz. 2-1/8 inches long including surgical earwire, 1 inch across. Etruscan style of domed circle and half circle shield with dangling beads, cast in pewter and antique silver plated. Lead and nickel free. 1-7/8 inches long including surgical earwire, 1 inch across. Triangle with flower center and squiggle border, cast in pewter and antique silver plated. Lead and nickel free. 3-1/2 inches long including surgical earwire, 1-1/8 inch across. Flattened wires formed into long curved stalks, cast in pewter and antique silver plated. Lead and nickel free. 2-7/8 inches long including surgical earwire, 1-1/4 inch across. 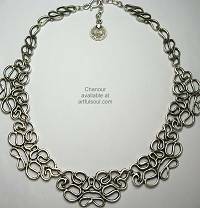 Double-washer and washer shapes intertwined like a chain maille motif, cast in pewter and antique silver plated. Lead and nickel free. Read about what others think of Chanour jewelry! Instead of reviews for a specific product, this is a place to share about the designer line in general.